paper bag & string: Why paper bag & string? Why paper bag & string? 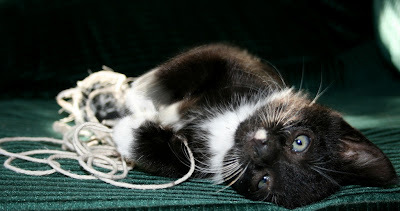 Why did I name my blog "paper bag & string"? I wanted to write a blog about cats... and creativity... and looking at the world in a new way. Like cats do. To cats, a paper bag is not about carrying things. 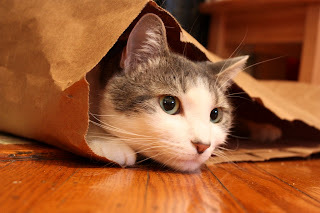 Instead a paper bag is a fortress... a comfortable bed... a place to hide. A piece of discarded string becomes a mouse... a chance to be silly... or a time to demonstrate some athletic prowess. We can learn from cats. The way they look at life. The quiet way they observe. The way they take time to enjoy each moment. And since I wrote a book titled Careers for Your Cat, you know I don't quite view the world the same way as some. Maybe it's because cats have shown me a thing or two. But I'll get into that later. Right now I'm going to stretch out and soak in that sun beam. Catsparella: My Twitter pal! Thank you for the wonderful welcome! And for the nice compliments. :) How did you find me so fast? I just posted! And I'm brand spanking new! Anything new and cat related online I will find it!! :) Haha, actually, someone must have clicked into my blog from here because I saw it come up as a referring source. I don't agree with that picture of the cat inside a plastic bag -- those things are deadly -- cat can suffocate or get strangled by one. Can also eat it with consequently fatal damage or a costly operation to remove it. Plastic shopping bags have been deadly to large dogs as well.